Premium Gift Wrap from Jillson Roberts is a unique gift wrapping paper as it's 100% post-consumer fiber, it's chlorine and bleach free and has a fun design featuring dogs in party hats! This is a 6-Roll pack with each roll consisting of 5-Feet x 30 Inches of wrap. The perfect wrapping paper for any dog lover or guardian! How cute is this?! 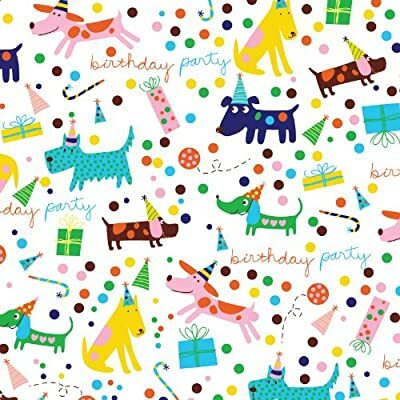 From its tail-waggingly adorable parade of party hat-clad pooches to its delightful background of party chaos, Jillson & Roberts Bark day eco-line gift wrap is sure to add lots of extra party fun to any gift. Each eco-line roll contains 5 feet x 30 Inches of gift wrap made from 100% post-consumer fiber that is chlorine and bleach free; the wrap core is also 100% recycled and has a minimum of 90% post-consumer fiber. To insure that all environmental specifications have been met, the final product is assembled and packaged in the USA. Jillson & Roberts offers the largest, most comprehensive presentation of eclectic and environmentally sensitive paper products available on the market today; proof that one can, indeed, give beautifully and responsibly.